Award winning Samba Villas and Spa resort comprises one tastefully decorated 3-bedroom, 3-bathroom villa with fully equipped kitchen, 2 terraces, direct access to the pool and overlooking the beach. The resort also features family suites which can sleep up to 6 people and a number of grand deluxe rooms, all very comfortably spacious with extra room details such as hairdryer and cofee/tea making facilities. On the beachside Samba Restaurant and lounge offers an all day menu with international and Asian choices, and a great lively yet intimate evening atmostphere with nighly live music from the best local bands. What sets this resort apart is its location: the very ambience of Samba creates a hub of its own. 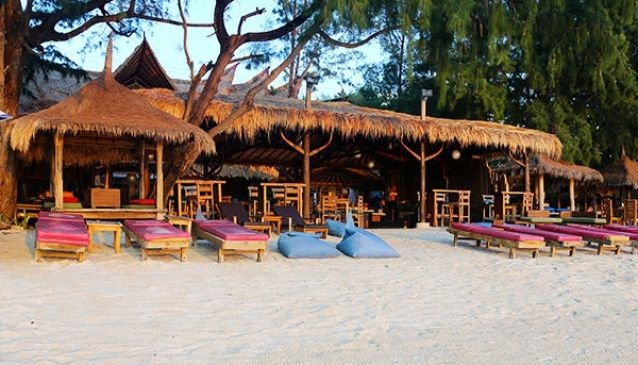 For beachlovers, the restaurant/lounge is directly on perhaps the best beach spot of the east side of trawangan, overlooking gorgeous tropical waters across to Gili Meno and Rinjani beyond.